Some links I had bookmarked are on the topic of sexism. I had planned to build a grand post linking it all together, but I think that is beyond my ability to pull off well enough. My slightly less ambitious approach below is to just explain the links I collected (and some additions I found specifically for this post) and why I did. Note that it has been a while I reviewed these links in detail. I will do my best to skim all of them and put warnings where needed before hitting “Publish”, and most of them will have been written by authors careful to put their own warnings on, but a blanket trigger warning might be appropriate here. It must have been a couple of years back that I first saw a post on Boing Boing on this topic. 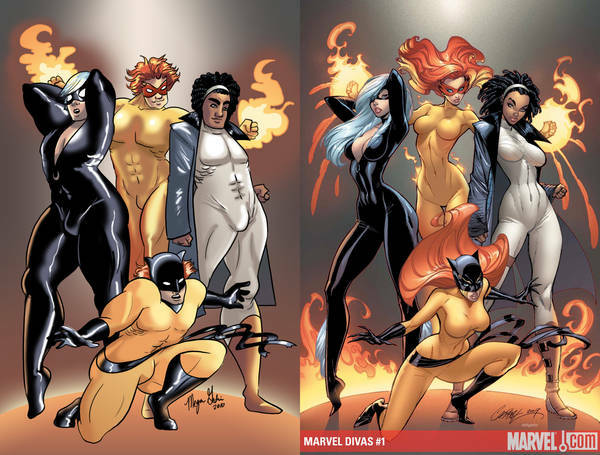 Everyone knows how female super-heroes … let’s say, do not have exactly the same kinds of outfits as the men. The standard counter-argument revolves around how unrealistic the male characters look as well… except they do not get put into over-sexualised poses at the same time. It’s funny how images like this elicit “ow my eyes” and “make-it-go-away” style comments from guys that’d otherwise make the exact argument I reference above. Hypocrisy much? On the flip-side of this particular coin, there is a Tumblr that specifically has images of Women Fighters in Reasonable Armor. It’s what it says on the packaging. Again, I’d recommend against reading the comments, but the images should be okay. That last link above belongs in this section as much as the previous one. 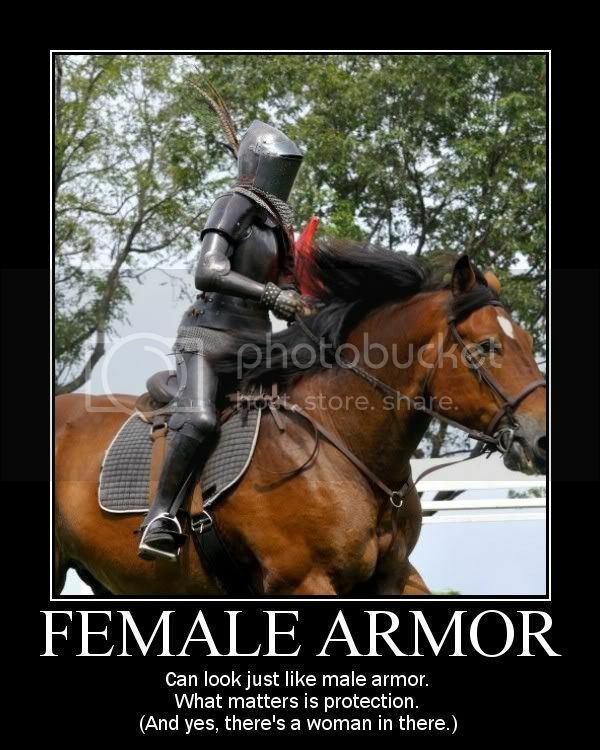 There is another Tumblr called Repair Her Armor that takes images of skimpily clad female characters and fixes them up. There is one specific post that digs into the dire state of female outfits in most MMORPGs though: Clothes I’m Forced to Wear in the Majority of MMORPGs. Now, let’s not get too stuck on clothing… it’s not the only problem surrounding women in gaming by a long shot, but it may well contribute to some of the other problems. And let’s be clear, as Anita Sarkeesian herself suggests; there is nothing wrong with enjoying the games. But it’s important to acknowledge the problematic and pervasive dis-empowering stereotypes these games are commonly built upon. I hadn’t realised how common the Damsel-in-Distress is until she put loads of them back-to-back Daily-Show-style. Then, early last year there was a story surrounding a Capcom fighting competition turned reality show (trigger warning). There is a video that shows how a female member of the team being shown gets harassed. And the story includes gems that equate the fighting game community with sexual harassment. By the coach of one of the teams. It’s stomach-curdling. Unfortunately this isn’t unique to fighting games. And it’s also not unique to the players alone. The story of Jennifer Hepler who got stalked and harassed on the Internet (trigger warning) for indicating in an interview that she doesn’t like playing games so much as experiencing the stories they contain. Her job? She’s one of the writers for Dragon Age. The same players that enjoyed her contributions to the story of the game ended up crucifying her over the admission that story matters more to her than play. Ever hear of the Bechdel Test? Surely that cannot be a very difficult bar to clear for a movie? You’d be surprised. Painfully and unpleasantly surprised. This is by no means comprehensive, I just picked a few of the most recognisable titles for the list. And all the ones I’ve seen were very entertaining and I would see again. But that doesn’t change how troubling the systemic nature of this fundamental story flaw is. Many more movies that technically pass would fail the test if it required a whopping 60 seconds of conversation fitting the aforementioned requirements, so let’s not even go there. This one I feel least able to be objective about, so instead of doing my own writing I will summarise the links I had bookmarked on this topic. They are all worth a read for what it’s worth. I haven’t checked every article below in detail, so a general trigger warning applies… and again, don’t read the comments. Never a good idea on these kinds of posts. I’m not sure why this post. Actually, I am. Going through life as a straight white male is the lowest difficulty setting possible, and sometimes it’s good to remind myself of what a very common higher difficulty setting can look like.